Deb's Cup of Tea: "You have good range of motion"
Today was the appointment with the orthopedic specialist to see about the root cause of my shoulder problems. He took a very detailed medical history and then a very detailed shoulder pain history. After that came the "do this" routine. "Make chicken wings and move the elbows back. Does that hurt?" No, but I can feel kind of a pull in that one spot that bothers me. It hurts because you're applying pressure, not because the muscle hurts. After 5 minutes of motions, he sat down and explained what he believes is wrong. See that bone called the "Acromion"? Mine has a point on the end of it. Normally, it's rounded, as the illustration. 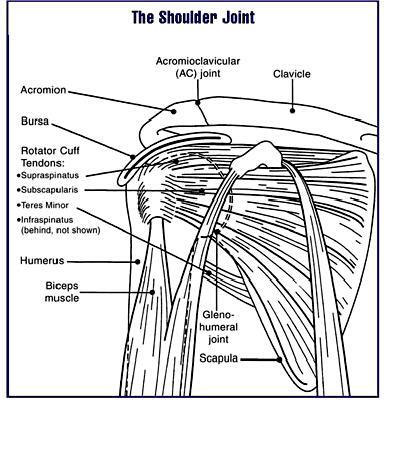 My point can cause the bone to get "hooked" on the bursa or the rotator cuff tendons in the shoulder, irritating them. I have Bursitis, an inflammation of the bursa. I've had that for decades. I may also have a deep muscle tear from who knows when that has never fully healed or has been re-injured. Plus, as you get older, you lose range of motion. All of these things combine to cause problems for my shoulder. Step 1 - Continue with the muscle relaxant. It's helping my shoulder heal. I also need to not shovel 2.5 feet of snow until June. Step 2 - Get into Physical Therapy. He's written a prescription for 10-12 sessions. One of the places they recommend is a half mile from the house. I need to call them and see if they have evening hours. If this doesn't work, there are injections he can give me to ease the inflammation and more physical therapy will be necessary. If that doesn't work, then there is surgery to file down the bone so it's not going to irritate the muscles under it. He emphasized that's at least 8-12 months down the road and he might do arthroscopic surgery before something like that. I had PT years ago for my shoulder. For awhile, I continued the exercises but life got busy and, well, we all know about "good intentions". And, the last time I was in pain like that experienced on March 24th was back in 2006 so that's 4 years ago. Still, I have good range of motion. I'd like to keep it.